HomeBlogFrom the BlogEven more conferences! There have been a few posts here recently about conferences and other meetings. I have been to four over the last several months, so it is not hard for me to continue this fine tradition. The first one, back in September, was actually not a regular conference, but rather a Summer School, on Complex Motion in Fluids, in Cambridge. 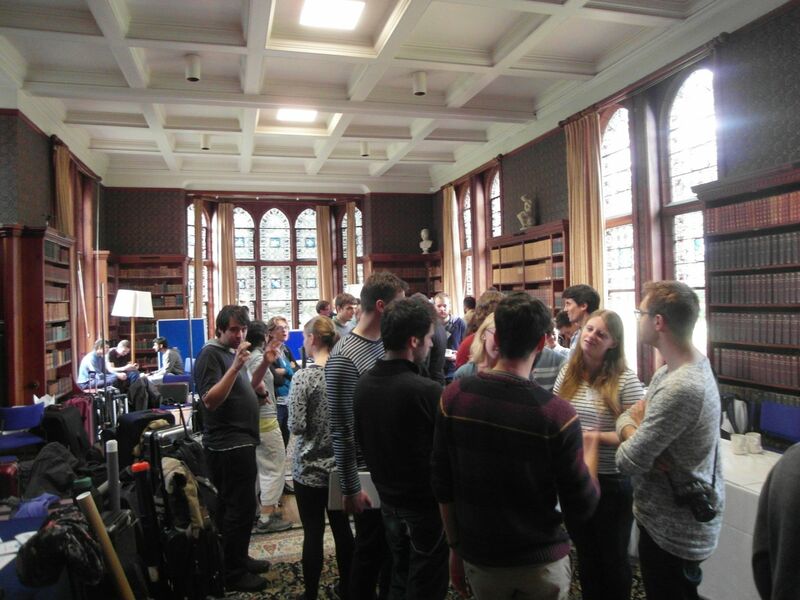 As is often the case with such events, it was geared mostly towards PhD students (so I felt a bit old at times! ), we lived in a student residence (in this case, one of Cambridge colleges) and the speakers, instead of regular talks, tried to give more pedagogical overviews of their research or a whole research area. This particular summer school is a yearly event (so it has developed some strange traditions, like singing a song together) and a collaboration between four universities, one each in France, Denmark, the Netherlands, and the UK. There were nine principal speakers (plus a keynote talk by Keith Moffatt, a local fluid dynamics celebrity) and most gave two lectures. The range of topics was quite broad — here are a few examples. Henrik Bruus (notable for being the author of books on topics as different as microfluidics and many-body quantum theory of solids) talked about flows created by sound (acoustofluidics) and how they can be used to sort and hold particles. Detlef Lohse (the head of a huge group at Twente) discussed drop impact on a heated surface (a topic of particular interest to me, as it seems a natural application of the computational approach I am developing), and in his second lecture, a variation of the ouzo effect (mentioned on this blog some time ago), where a drop consisting of a mixture of water, alcohol and oil evaporates, a multistage phenomenon producing fascinatingly complex flows. Dominic Vella talked about elastocapillarity, in particular, wrinkling elastic sheets on liquid surfaces and a surprisingly complex problem of wet brush bristles sticking to each other. Denis Bartolo's lectures were about a system of active colloids and its hydrodynamic description and Roberto di Leonardo talked about microswimmers and, in particular, how bacteria can drive a motor and how this can be controlled by light. Jacques Magnaudet discussed flows created when a disc falls in a liquid or a particle crosses an interface. Anne-Laure Biance talked about various electrokinetic effects, in particular, how an electric field can stabilise a foam. In addition, nearly all of more than 100 attendees either gave a short talk or had a poster, which broadened the range of topics even more. I had a poster as well; in fact, it was the first "proper" A0 poster I've ever done, as in the past I would just print out a few A4 sheets, perhaps gluing them together (or not). All in all, it was good fun. The only problem was, the college where we were based was literally in the middle of nowhere and too far from the centre of the city, so I only managed one trip to the centre and with the traditional Warwick fluids walking trip immediately afterwards there was no chance to stay longer. So I had to run an orienteering race in Cambridge in October as an excuse for another visit to the city. The second conference was the APS DFD meeting in Denver. Juan has already described it very nicely in his post (which even has my picture! ), but I'd like to add my perspective from the point of view of someone who attended around a dozen APS meetings in the past – just not the DFD ones! As a condensed matter physicist, the meeting I would normally go to is the APS March Meeting dedicated mostly to condensed matter and biophysics. The basic structure is the same – most talks are 10 minutes long, with 2 additional minutes for questions. However, there are subtle but crucial differences. First, there is a one-minute break between the 12-minute periods in the DFD meeting, but not in the March meeting. Second, during a talk the remaining time is shown on a big screen in the DFD meeting, but in the March meeting there are only sound signals to warn you two minutes before the end. The result is that the DFD meeting is run much more smoothly and strictly on schedule, while during the March meeting running behind schedule is very common. Also, the one-minute break is enough time (though just barely) to move between different sessions. On the other hand, the thing that I like more about the March Meeting is that there are many more longer (30-minute) invited talks – most sessions have one or two and there are many sessions consisting of just invited talks. Longer talks are easier to understand and they are a great way to learn about a new area. I must say, though, that many 10-minute talks at the DFD meeting were quite understandable despite the limited amount of time the speakers had, so this was not as much of a problem as I feared. As for the content, my choice of talks to attend, obviously, reflected my interests. So I went to a lot of drop impact talks, both experimental and computational, including drops falling on liquid films (hot and cold, still and flowing, miscible and immiscible), on inclined, moving and "hairy" surfaces, on granular media, under reduced ambient pressure, superfluid drops and even drops shot with a bullet! One session mostly consisted of talks (many from the Bush group at MIT) on drops "walking" on a vibrating fluid bath, a system that was suggested a while ago as having some similarities to quantum systems. There were also several sessions on wetting and moving contact lines (James gave a talk in one). Many talks were on instabilities of liquid jets and films and I went to a few, as it is another area of research in which our group is involved. Examples of systems that the speakers considered are a ferrofluid jet on a wire through which an electric current is driven (this talk was later repeated at the Oxford workshop mentioned below), the effect of surface viscosity on the Rayleigh-Plateau instability (doubly interesting, as Jesse uses the surface viscosity concept to model particle-laden drops) and stability of metal films subjected to laser irradiation. Among other bits and pieces I found interesting was another talk on surface rheology (with particles) and work from Snoeijer's group on the distinction between surface tension and surface energy for wetting of stretched solids. Tourism-wise, as it was my fourth visit to Denver, there was not much left to see, but I did go to the local museum of nature and science with some nice dioramas and interactive exhibits. Some time ago, Livio wrote a post about a meeting of the Multiscale and Non-continuum Flows Special Interest Group (SIG). It is not the only fluids SIG – in fact, there are 41 of them! Another one of interest that James is a member of is on Drop Dynamics. It is chaired by two brothers, Alfonso and Rafael Castrejón-Pita, and both meetings held so far were in Oxford. The first one was in April and consisted of talks by the group leaders; for the second one, the organisers gave the opportunity to speak to students and postdocs. So I gave a talk there as well. I don't talk at small conferences very often and I must say that it is a nice experience: you don't need to introduce yourself and people often approach you themselves to chat and so even someone as socially awkward as me was able to talk to a few people. As for the other talks, perhaps the most unusual one (and only tangentially related to the topic of the workshop) was on electrospinning of polymers used to create … a model of white matter of the brain. Closer to the topic of drops, there were a couple of talks about drops moving on oil-impregnated surfaces providing very low contact angle hysteresis and therefore friction; there were also a couple of drop impact talks, one about simulating drops hitting a surface at 100 m/s (!) and the other about impact on hydrophobic textiles (think fancy umbrellas). Ciro Semprebon talked about Lattice Boltzmann simulations, in particular, of drop-drop collisions; obviously, he was not able to resolve the air film between the drops, so only drops of two immiscible fluids could be simulated and he was understandably impressed by our simulations of identical drops. There was also a nice talk by Chuan Gu on simulating particle-covered drops; it is of obvious relevance to the problem Jesse is working on and we have decided to invite Chuan's boss, Lorenzo Botto, to Warwick — he will give a talk at our fluids seminar in a couple of weeks. Finally, the Technical Workshop in Cheshire … but as Stephen and Jason wrote about it and my post is already pretty long, I'll just say that it was fun and gave me an opportunity to visit Liverpool afterwards and will finally shut up!